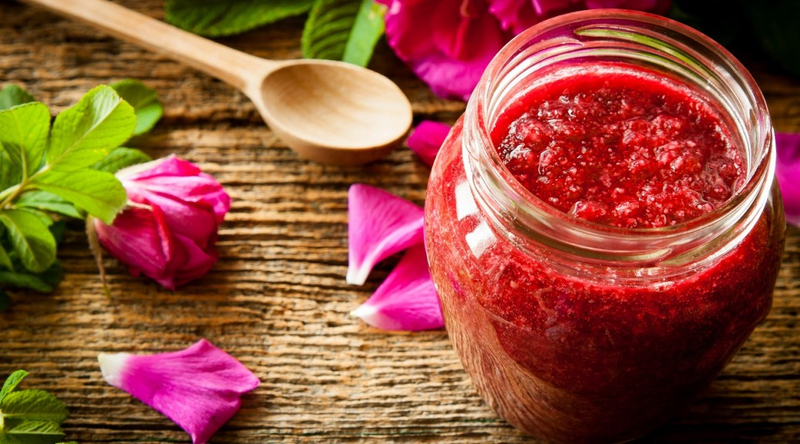 Gulkand or rose-petal jam is one of the most delicious Ayurvedic preparations ever known. At the same time, its health benefits are undeniable. The word gulkand is derived from gul, which means ‘flower’ in Persian, and ‘qand’ which means ‘sweet’ in Arabic. Ensure that the rose petals are clean and free from insects. Separate them, wash well and dry them. Arrange a layer of rose petals, top it with a layer of granulated sugar. Keep alternating them till the jar is full. Close the lid tightly and keep it in the sun for upto 7 hours per day for about 4 weeks. Every alternate day, mix the ingredients together with a wooden spoon. At the end of 4 weeks your gulkand will be ready and will have a jam-like consistency. Gulkand is very easy to prepare, and is delicious as it is, or as an accompaniment to your meals, or even as an ingredient in sweets or milkshakes. The most commonly known benefit of Gulkand is that it has a cooling effect on the body. In addition to this it has a plethora of other wonderful benefits for your health and happiness. Pacifies pitta dosha: Gulkand pacifies excess pitta in the body which can cause heat, and so keeps the body cool. It alleviates heat-related symptoms such as lethargy, rashes, aches and pains and reduces any burning sensations in foot soles and palms. Improves memory & eyesight: It also helps enhance memory power. It is a powerful antioxidant which also helps in improving eyesight over time. Helps digestion: Take one or two teaspoons of gulkand daily also to reduce stomach heat and acidity. It also helps in improving appetite, and enhancing digestion to keep you at ease and free of any irritation in the stomach lining. Excellent skin tonic: Gulkand is great for the skin. It removes toxins from the body and purifies blood, and so prevents various skin problems like blackheads, acne, pimples and rashes. Protection during the summer: Have two teaspoonfuls of gulkandbefore going outdoors in the summer sun – it helps prevent sunstroke by cooling the body. It also prevents nosebleeds that occur due to excess heat in the body. The above were just some of the wonderful health benefits that gulkand has to offer. Anyone can benefit from the wonders of gulkand; however, diabetics should consult their doctor before taking it.